Sunil Gangopadhyay's precious writings collection is 'Panchash Bachhar', there are collection of novel, poems, short stories, long stories, humorous, articlas, travel story, drama. 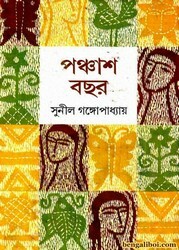 The author is a great personality of modern Bengali literature. He was widely known to the Bangla language-speaking population as one of the greatest personalities of Bangla literature. He used many pseudonym as "Neellohit", "Sanathan Pathak" and "Neel Upadhyay" etc. The author is always in the mind of literary thirsty readers. Today's sharable book is selected writings collection of this author. The ebook has 363 pages, 20mb file size.